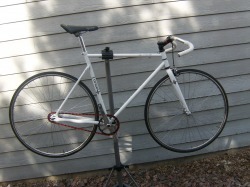 We are going to be bringing in Singular Bikes for our custom build program. These are great bikes and look so nice - we will have some photos as soon as the first custom build is done. We can walk you through the process for ordering one, as well as just order you a frame, depending on what you want to do. 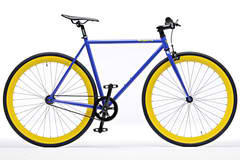 Singular Bikes are perfect for the WeFixie crowd, with the Swift, a 29er; the Perrigrine, a Monster Crosser and the Kite, a true Cross Bike. We can do some customization, but this is a new line of super cool bikes we will be bringing in. There are several models and if you can believe it, they start at just $325 brandy spankin new! Please contact for availability of the Pur Fix Bicycle Line that we have. They are so awesome and ride great! This is a sample of our new bike custom build program. Although this has a mixture of some gently used parts, it is a new frameset, along with several other new parts, and is set up specifically for the customer with their consultation. Below is a price list regarding the new bike custom builds. Many options are available, and if you are interested, please feel free to email us at wefixie@hotmail.com and we can get the process started.